I will be using this area to post photos of works in process. So, if you have given me a commission look here to see what is going on. If your just curious to see what I am up to then by all means stop by and leave a comment if you feel the urge. I try to take good photos when I am done with a project. The photos here will be nothing more than snap shots. Quality, composition, lighting and the like may vary on the bad side. Oh snap! I think I know who this is for. I like the "On the bench" idea. Not only does it let the customers know what's going on with their orders but it also shows the process involved. Oooh.. I recognise that guy!! I just got done doing one in bark.. THis will be fun to come see whats on your bench cuz your bench is MUCH cleaner than mine.. much. 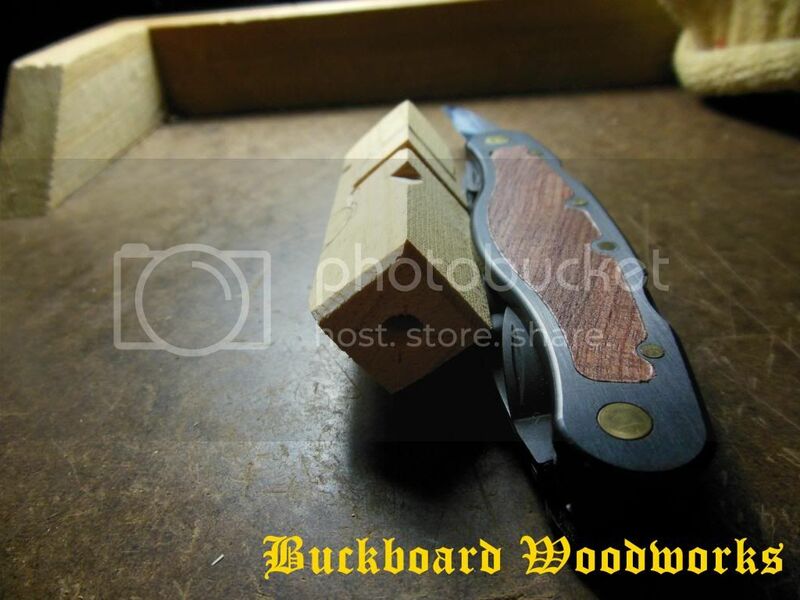 Thats the flexcut carving jack right? How are you liking it so far? Well this will be the first start to finish project with it. So far, I am really liking it. Stay tuned! Great idea I'm tune into "on the bench". Hey , Buckskin....is it done yet? Nooop. I have been doing my school work. I will whittle on it in a bit. I decided to use my little 4mm skew on the tight spots. I could do it with the knife but the skew is so much easier. Ok..now.. I spy a Ramelson skew... where are you using that on the Santa? I have the v tool of Ramelsons and have looked at getting the whole set , but wondered if I"d use them. Yes, I have the micro palm set. They are handy little buggers to have when working small. Ho ho ho.. he looks good to go!! Now the fun part of painting him or no? The picture of the one with the wolf... is that a button? Soooo.... verdict on the carving jack yet? I need to add some texture to him and then, yes, this one gets a paint job. I am going to try and do the texture with the carving jack so the final verdict is still pending though positive at this time. 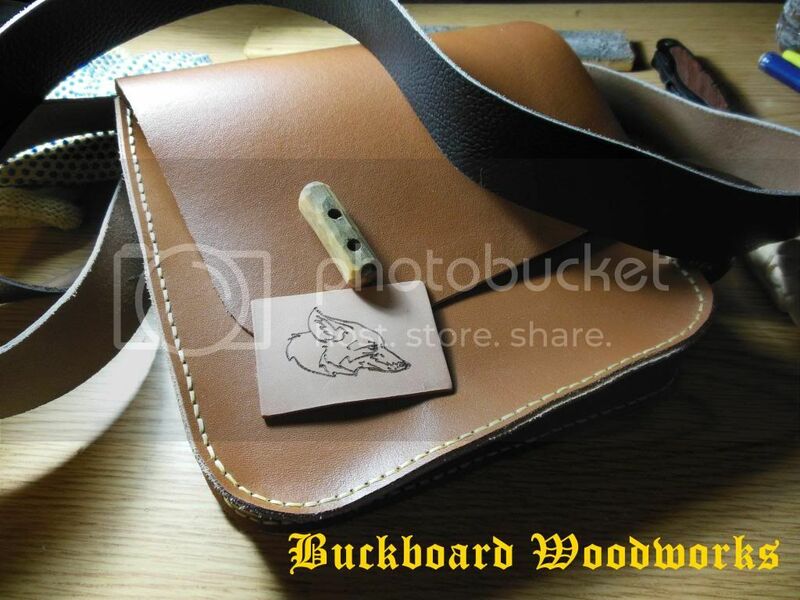 The other is the shooting bag I have been working on the the wolf is a leather patch. I burned the wolf in. The other is a button. While I am waiting for paint to dry I might tinker with a means of closure for the shooters bag. I think its about time to chase some fuzzies and paint this guy. That had better not be Santa! It's too dagone early for Christmas! LOL. Nice work, by the way. Yep, that would be the furry, fluffy fellow in the red hat! Getting close! Once the was dries say tomorrow evening, I will spray some satin sealer over it. When that's dry I will epoxy the firesteel in and make a lanyard and he will be ready to go! Ole Saint Nick looks great. Nice looking piece of work! You make it look easy. Thanks. I've been workin' out. Nice! He turned out great! 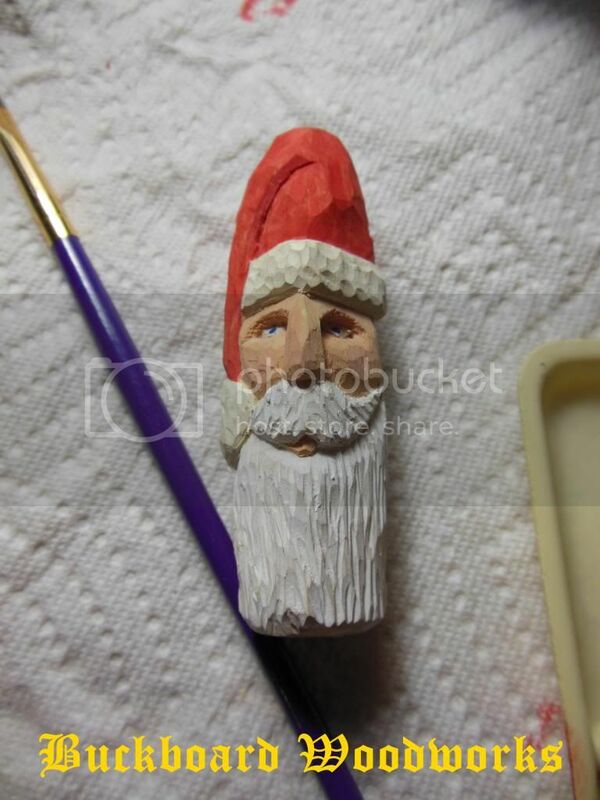 Now I'm in the Santa Carvin moood... lol I"ve got a few done and sitting on the painting table. I do think I like that carving jack.. I'm impressed with what its done so far. How about you? What brand of Satin spray do you use for sealing ? Thank you Ma'am! I use DEFT clear satin lacquer on raw wood and use Rust-0leum Clear satin paint on painted stuff. 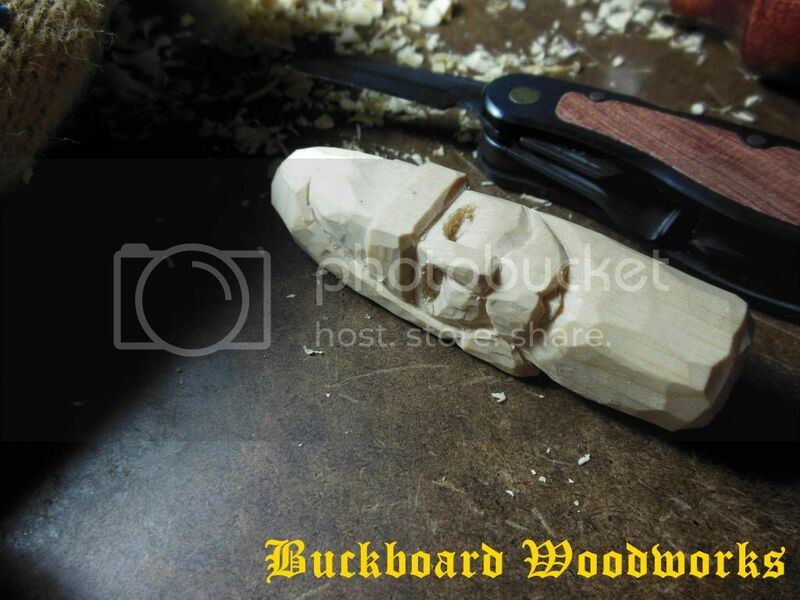 I really like the carving jack. There was just a few things I used the skew on the rest was done with it. 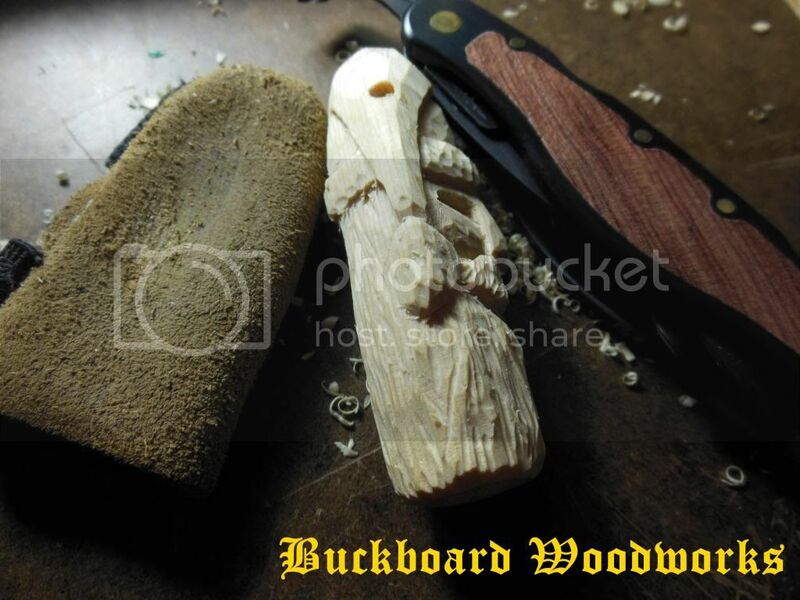 I am glad I got it and would recommend it to anyone who carves. I would recommend along with it you get the slip strop as well. I found some places that sell just the knife. The slip strop makes honing all the curves and vees a snap. If you have a minute I'd love to see a pix of the strop. It might be one I've already gotten? Actually with three orders of tools from flexcut I've got three different ones now. Is it ok to ask where you purchased the micro tools from? I could use a small skew for the cottonwood carving windows I think. I have the U gauge set ..and I'm totally blanking out on the name brand right now..sorry about that. Shoot.. I had to come back, I forgot to tell you about those bristle sanding disks for sanding beards and hair like your doing on your santa. I really like using them, they get down into the ridges really well. I have the sub-miniature set from these guys. Mac is awesome to deal with. So, I give him my business when I can. Have a look at this for the strop. If it don't work I will take a photo tomorrowish. And finally, are these the bristle disks you are revering to? Yup.. I do have two of those strops. I've got one just about worn out already trying to get to the inside of most of my tools. Then I figured out something new.. I use the fuzzy buffer wheel for my dremel. I schmere it with the gold stick and run the dremel on 1. And then lay the tool on that to get the inside buffed up nicely. Yes..those are the bristles! I LOVE those things. I actually need to make another order for the white ones. THey dont damage or eat into the wood when trying to clean up beard lines. 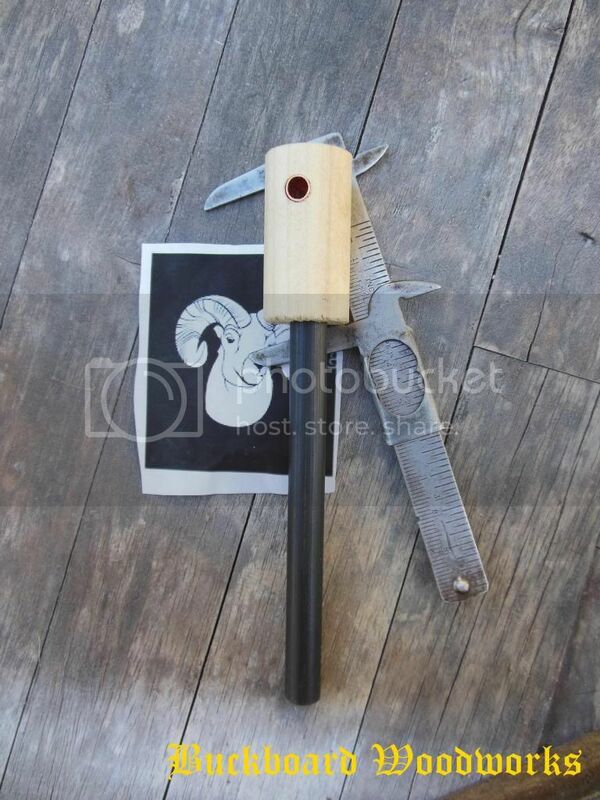 YOu can use one or four on the mandrel. And then I had this bright idea to put a washer in between them to space them out a bit. Worked wonderfully. Have you used them? I have the small V tool from the ramelson set. 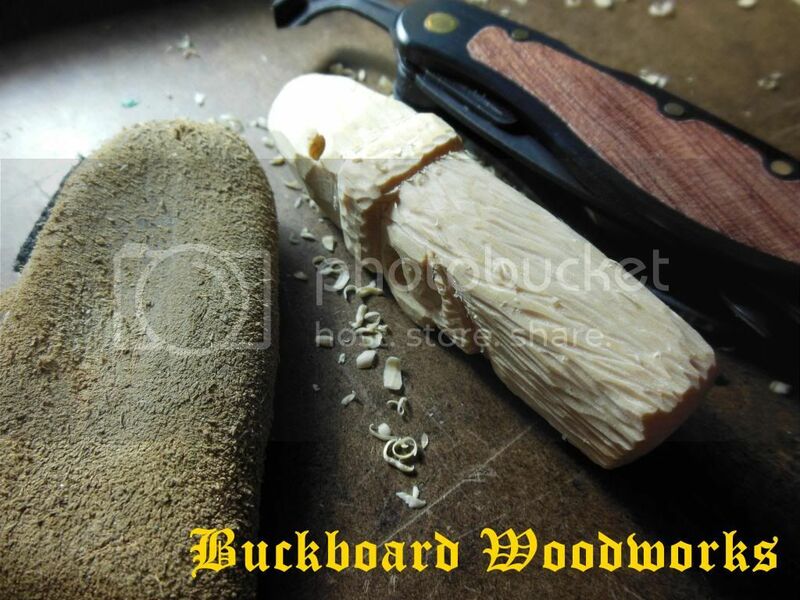 If I head out with carving tools..its my two knives and that V tool that I grab. Its a favorite. I would like to hope that the skew in that size would be another favorite too. Something to get down into those lil corners where one lil fuzzy lives and will not be evicted... you know those ones I'm sure. I've been to this site before.. doing window shopping.. When times look a tad bit better here I just may pick up that carving set and some disks... Thanks for reminding me of it. 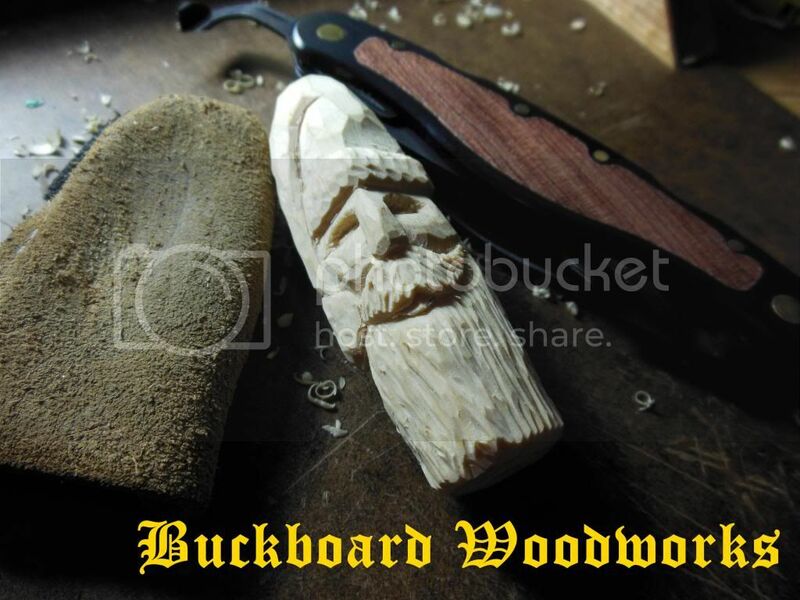 Do you carve up alot of Santa's for Christmas? One year I did 120 of the ornies... never again. I was so sick of red and white paint.. LOL Switched to lil penguins last year. This year there will be a mix...more colors to play with. hah! 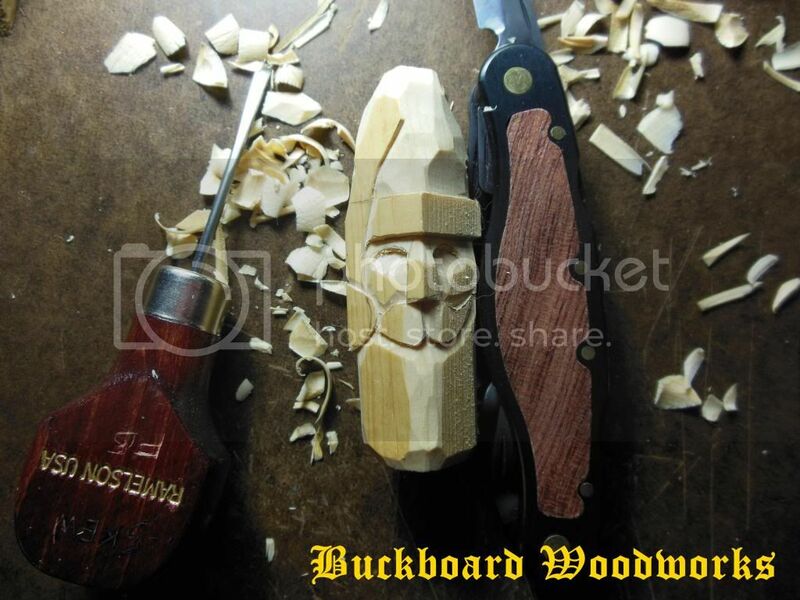 I have not been carving much at all the last year or two unless I have an order. I need to change that. I want to get back into doing shows. No.. it never ends. Hobbies are expensive.. I've been helping my brother with his HO scale RR. Making alot of tree's for him. I told hubby I'd love to get a train set of my own...but that hobby is waaay too expensive. And I have too many hobbies the way it is...uffda. Carving has become my passion tho. Bushcrafting comes in second. 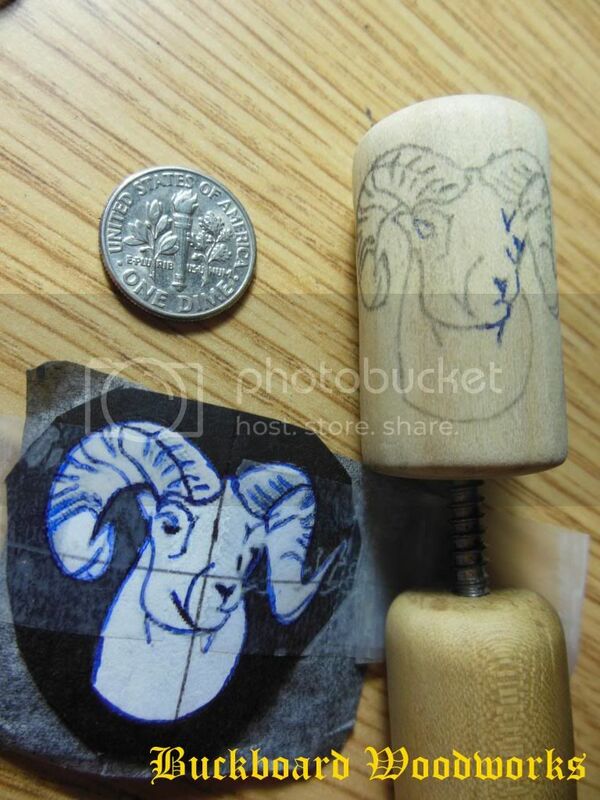 Have you carved on Cypress knee's? I've heard and seen wonderful things about that wood too. No, I have not carved on cypress knees. Every time I have gotten around them I felt like they wanted to much money for them. It is on my list though. ahh yes.. I see flexcut tracks... Buckskin... do you have a bench dog ? No Ma'am I do not. I am going to have to come up with something though. 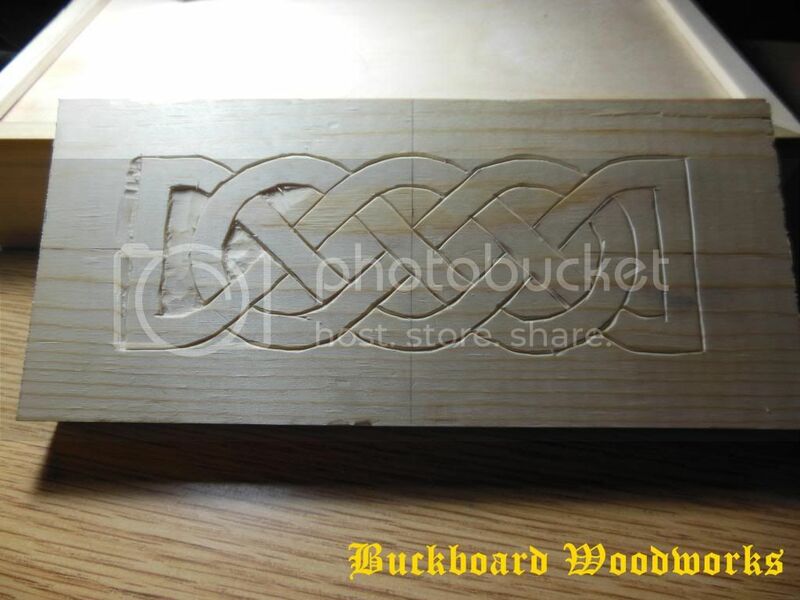 Nice work on the celtic pattern. This wil be fun to see when it's finished. Buckskin... you changed your avatar...did you get an owie? Mmmmm? Actually, I'm wondering where he got a pic of that patch - that's hilarious. 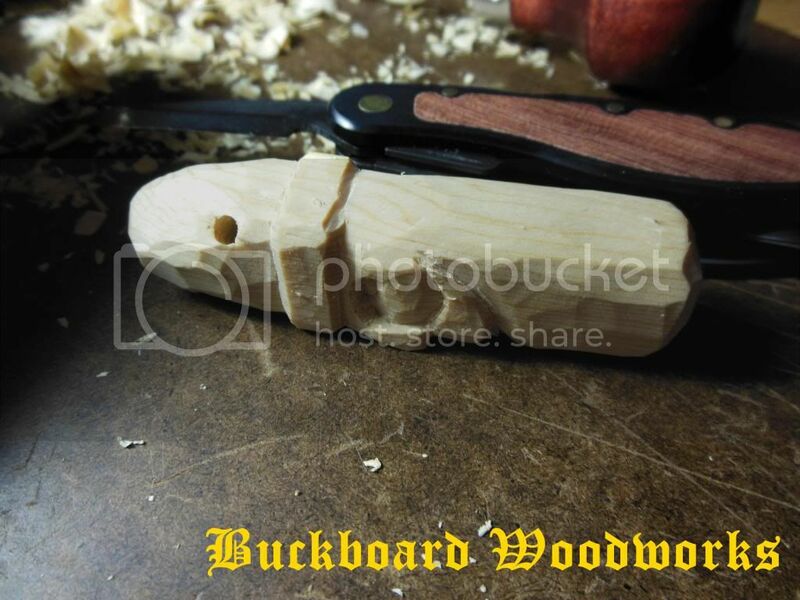 Also, if this has been answered elsewhere, I apologize... What is that folding carver you're using? 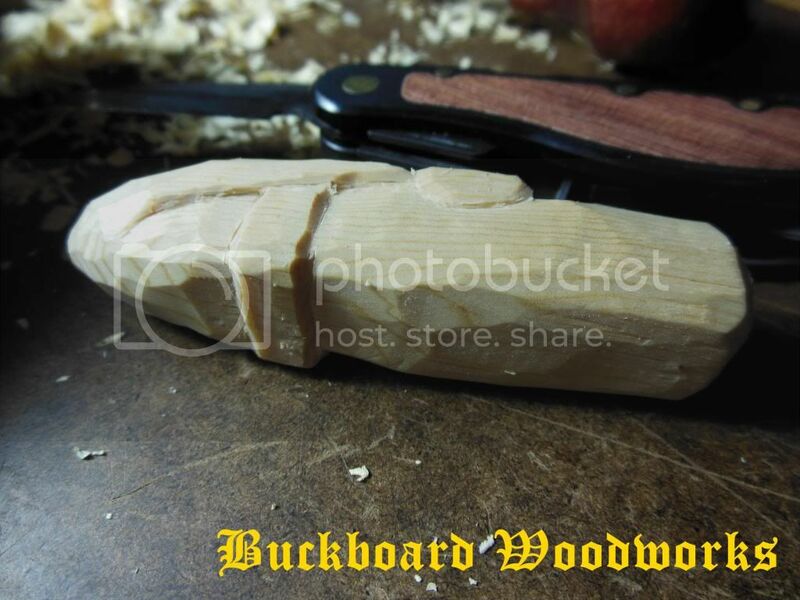 I googled finger carving under images and it came up. 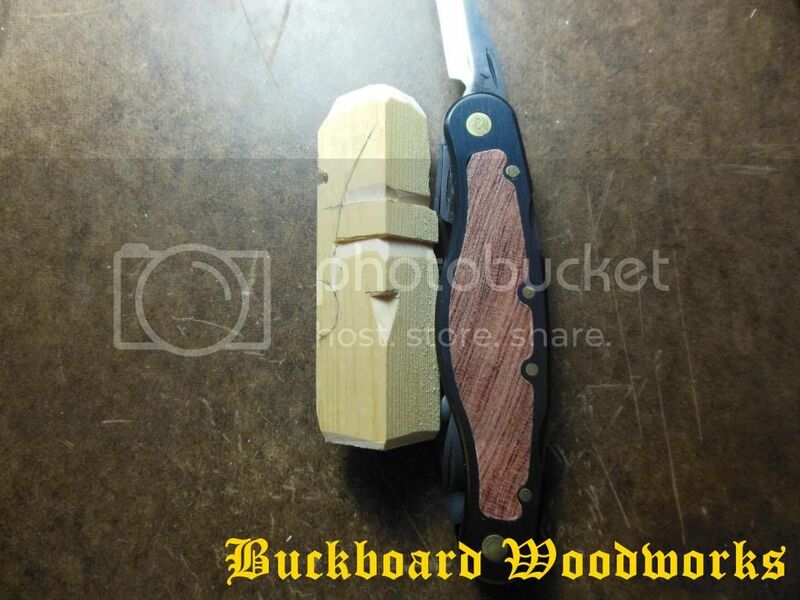 The knife is the Flexcut Carving Jack. Apparently that is a real merit badge. I was of the understand it is a spoof merit badge. I will have to look in to it a bit farther. You're right, I was wrong, the store name threw me off (boyscoutstore). 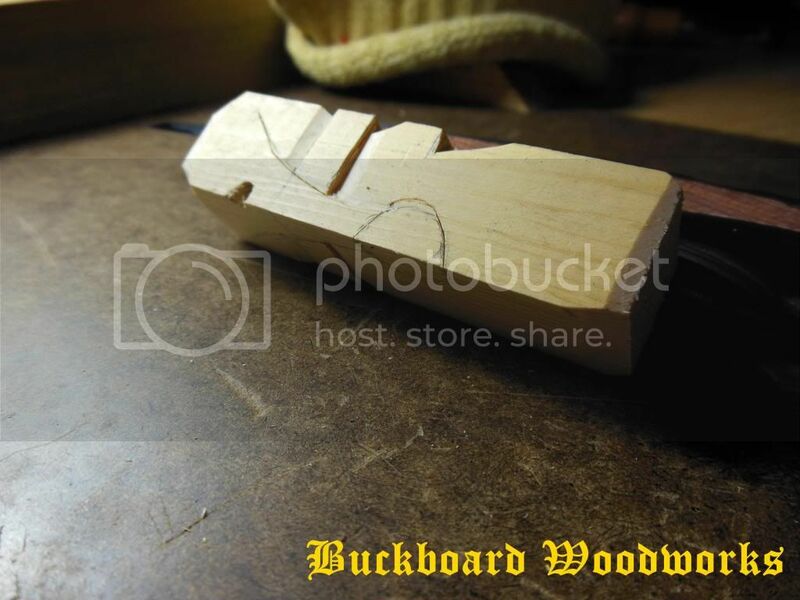 Sorry for thread derail, carry on carving! For size comparison, the rule on the old school caliper measures 4". It might be 5" over all. Here is an update finally. I have been swamped with school work and I started a temp job. It will come.